If you or someone you love is suffering from a body-focused repetitive behavior (BFRB) such as trichotillomania (hair pulling disorder) or excoriation (skin picking disorder), you may feel alone, confused, frightened and in need of help. Many professionals have outdated or simple erroneous information regarding effective treatment options. Members of our Scientific Advisory Board have reviewed the latest research and clinical information, and designed this pamphlet to provide some guidelines for individuals seeking treatment for these problems. Each order comes with 15 brochures. 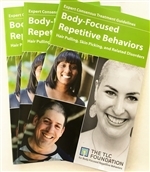 The information in this booklet is not intended to provide treatment for body-focused repetitive behaviors. Appropriate treatment and advice should be obtained directly from a qualified and experienced doctor and/or mental health professional. The cost is to cover shipping. International orders may have additional shipping charges.